So what exactly is WP Fresh Pop? Well its a WordPress plugin that allows you to add a unique kind of pop up to your site. Normally pop ups are designed for on exit, to trap bounce traffic. However WP Fresh Pop is designed to show always. The point of it is so that you can have a pop up that highlights something important about your posts. You can actually see me using it on this post to make sure people are aware of the bonus I am offering for anyone who picks this up though my link. While using it for a review and to mention a bonus is one way this can help you there are other ways as well. If your selling physical products you can use it for coupons and special offers (or even for additional info about the physical product your selling). If you have any training / tutorials or content posts on your site you can use it to offer a freebie and then link to an optin page. Anytime you have a post on your site with content on it, but want to provide some kind of additional information, offer, or value, WP FreshPop is going to come in handy. While the plugin was working for the most part there where some ‘fine tuning’ things that I really felt could be improved. There where several GUI issues that needed to be fixed. The plugin was tracking views for your pop ups but not clicks, which made no sense because the way you tell if its working is if people are clicking it, not if people are viewing it. There was no call to action button (you had to have your button image be a part of your pop ups background image). A couple of days after sending this video to the vendors they messaged be back telling me that they did an update and addressed every issue I mentioned. They fixed the GUI issues, added in the more sensible click tracking, and even put in a customisable call to action button that you can position in your pop up anywhere you want. That was awesome, unfortunately however after getting the newest update I found a few more bugs that where introduced with their updates. So I got on Skype with the vendors and explained it to them. It was kind of late my time when I was talking to the vendors however and I was getting a bit tired, so after going back and forth for a bit explaining the new issues to the vendor and trying to get them to understand how to fix them I decided to just take the easy way out. I fixed the issues myself in my copy of WP FreshPop and then sent the code changes to them. Sometimes the easiest way to get something done is to just do it yourself. First the only thing that is going to ensure you ‘crush it’ ever is hard work, motivation and taking action. No plugin will ever make you money magically on its own. I have no idea how they claim this is going to somehow magically make you 4 figures a month online either, let me be clear, this is a great plugin to help you get the most from your site visitors, but you will actually have to get site visitors for this to do anything. Also as far as the plugin goes what is the whole 30 minutes per day of work thing? The plugin is largely set and forget. Sure they added in some marketing training to help you learn how to get traffic to your site and help you make money with the plugin, but the thing is the added it after they made the sales page. Honestly I don’t like this headline one bit. While I understand marketers need to make their products exciting to potential customers I believe they went to far with this sales page and specifically this headline. So much so that I almost refused to endorse the plugin itself. I say almost, because even though I hate the headline, now that they made the changes I asked for (and the ones I provided) to the plugin itself I feel the plugin is worth investing in. I honestly don’t think they needed this over the top / super hyped up sales page. When I do my reviews I do not review the vendors, I try hard to keep my personal like or dislike for the vendor out of my review (I have approved things from vendors I don’t personally like, and I have rejected things from vendors I consider my friends). I also try not to take the sales page into account. I base my review on the thing I am reviewing, the software, and this plugin is a good plugin now. While it does not have the instant make thousands of dollars with 30 minutes of work sexiness that they are claiming in the sales page it is still a good investment. If your doing affiliate marketing its going to be great for showing off a bonus. For e-com it will be perfect for giving coupons, discounts, or additional information about the product. For content posts you can have videos explaining a freebie and a call to action leading to a squeeze page (making it kind of a 2 step optin). The plugin is sold at a very low cost so just one extra sale ever or just a few extra email optins will make you profitable from investing in this plugin and make it worth you having on your site. Because of this even though the sales page is largely a bunch of hype nonsense in my mind I am going to say that if you have a WordPress site it is worth considering. I can assure you that I will be using this on some of my future posts and I guess in the end that is the best endorsement I can give it. Thanks for another great honest review…Is this not something like your Video Takeover product which I have and really like? Yea its kind of like Video Takeover, only its more for your own posts etc, where VTO is about jacking peoples sales pages. With Google’s crackdown on “intrusive interstitials” on January 10, 2017, is there a way to not show the WP Fresh Pop popups on mobile devices? Most modern and updated WP themes are very “responsive” themes now, and for the most part – popups are showing on the mobile rendered pages. Currently its not possible to have this not display on mobile devices, but thats a good suggestion that customers should make. They have been really responsive to suggestions and this would be easy to implement. Hello, Brett, thanks for the awesome review of the new WordPress plugin called WP Fresh Pop, I must say that the product is good but I don’t want to be rude or anything, but your product VideoTake Over is a better quality product in my opinion since I’ve already had and I love it. My question is this, do I have to purchase the product in order to participate in the Beta testers of your new Software Review Wizard Pro? Well I think my bonus video was pretty clear 🙂 FYI: Im about to remove the beta tester bonus as I have just about gotten the number of testers as I need. Side note: Thank you for the kind words on my VTO software however VTO is designed for affiliate promos not for posts on your own blog. These are similar products, but with different intended uses. Great review Brett, warts and all! The thing I don’t like about these kinds of products is that when you but the product, you are then hit with the “PRO version upsell”! Why can’t vendors just sell the best software they can without adding all the best functionality for extra costs ? They can still have upsells that are “related” to the software, but this kind of selling tactic just gets my goat. Kinda like selling someone a nice car, but then upselling them to a proper engine. Um that does happen. Every car dealer in the world has an engine upgrade option. Example: My Kia came with a 1.6 and the upgrade option was a 2.0 .. (there was also an upgrade for the interior, the sound system and the tires) .. what vendors are doing is no different than what just about every industry in the world does. They are allowing people to only buy the ‘level’ that they want, need and can afford. The difference, frankly, is that in this space, the customers complaining about things that every other industry does has become a past time for them. Thank you for the review and generous bonus. In starting to work with the WP FreshPop plugin, I noticed that there is currently no way to disable the “suggested videos” screen at the end of YouTube videos. While I have contacted their support already about this, I just wanted to suggest to others using the plugin that Vimeo videos do not have this issue. Im going to suggest they make this change as well, and an option to turn it of on mobile devices. If they dont make that change .. I will. Thank you. I have heard back from their support and removing the YouTube “suggested videos” can be expected in an update within the next 48 hours. Hey Mark, Zeeshan Here Co-Founder WP FreshPop. We have disabled related videos. Plus we also have added a checkbox there to disable that popup in mobile devices. Kindly check your email. Great honest review as usual. 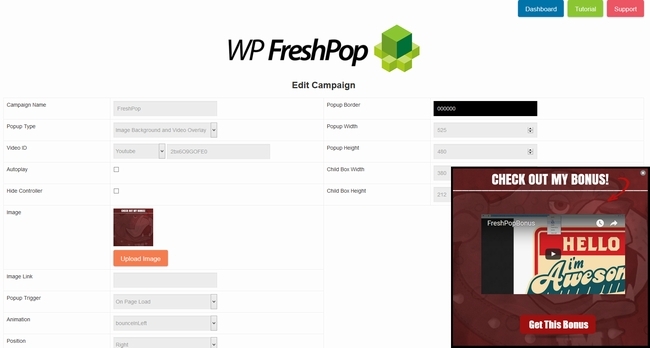 The pop ups that come with your Profit Canvas, isn’t that the same as WP Fresh Pop? No the popups that come with Profit Canvas are the normal kind .. they are on exit pop ups that cover the entire page etc. not ones that show always as you can see here. Brett, your bonus still available? Sorry, no it is not. Thanks Brett for your detailed review and helpful suggestions of improvement, picked it up. Not sure there were any bonuses of yours, appears not at this time. The OTO sounds like your page jacking tool. If you did not get it while the bonus offer was showing on this review, then the bonus has expired. This was a good review. But like you said, there was no actual see what the product does. The interface is fresh, clean-also it was green. When you’re green you grow. When you’re ripe, you rot. The interface you talked about values, this error checking is not uncommon, thus the developer is new at this. Over all, I would say for what they at least tried to accomplish, they did a pretty good job and deserve an good pat on the back for a good effort. A very good effort and for all involved, a great learning experience. There is this saying.. nothing is perfect and if you keep trying to make it so, you will never release anything- however for not being perfect- they did do a good job. The tweaks made all the difference is the world to the customers and that’s us.